This was a special live broadcast for Hata Sawako's solo program. It was about one hour long. Sawako was wearing a pink one piece with white flowers. There was a big ribbon in her hair, in the back. 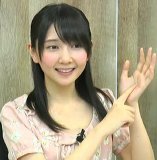 Sawako talked about starting her own interent broadcast show. The broadcast will be about food. Then she talked about food. When she's alone, Sawako doesn't eat that much. But when she eats with other people, she can eat a lot. 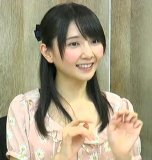 Sawako said she likes salty food. There was a short break in the middle of the broadcast. Sawako said they had already decided what kind of program it will be. 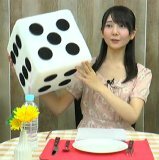 She will roll a die (a big one) and move around the Yamanote Line like a board game. Sawako will get off at the chosen station and walk around. They wanted to decide the name (title) of the show, and also the hashtag for twitter. The staff thought up some names. 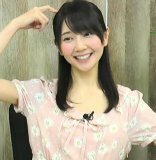 Sawako asked the viewers to think of some names too. Then they got 5 candidates, and there was a vote by the viewers. The title chosen was "shawagohan" and the hashtag was "shawameshi" (in all hiragana). Sawako said the first station will be Shinjuku, and they will go around the Yamamote Line in a clockwise direction. This program will be broadcast on the second Friday of every month, and there will also be a 10 minute omake for members of the Voice Garage Channel. There was also a 3 minute members only omake for this broadcast. 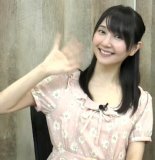 Sawako said she had a good time as it was a live broadcast where she can interact with the viewers.